That Yves Behar likes to get around. The industrial designer responsible for the bulk of Jawbone's product lineup, the OLPC and the Ouya game console took to the stage of the All Things D D11 conference to showcase the August Smart Lock. 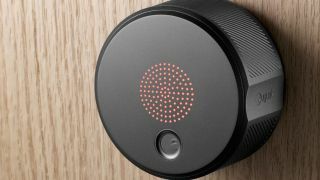 The lock uses Bluetooth 4.0 to connect to a smartphone to automatically unlock a door, without the need for pulling out the house keys. This approach allows you to completely control who has access to your home. You can set permanent permissions for your family members, or temporary permissions for tradesmen or friends. Through a web dashboard or the mobile app, you can also receive notifications and detailed logs of when people arrive or leave the building as well. Unlike similar digital locks, the August runs off four AA batteries and doesn't require access to a permanent power supply or Wi-Fi to work. When the batteries start to run low, the lock will send you a warning to change them. It's also designed to be installed by anyone, working with most current deadbolts on the market. Made from anodised aluminium and launching in a range of colours to match your decor, the August lock uses LED indicators and chimes to let you know when it's working, without having to look at your phone. And if everything goes horribly wrong, you can still use your key to get inside the old-fashioned way. August is currently taking reservations on the locks, which are expected to ship towards the end of the year. They'll set you back $US199 (£133, AUD$205 approx).